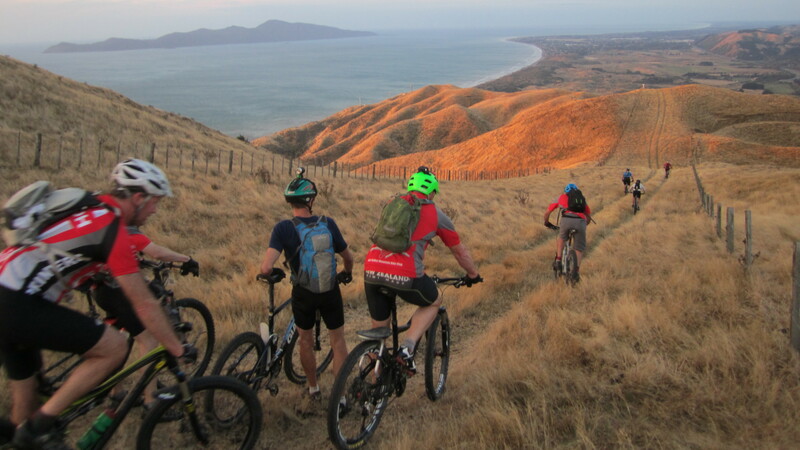 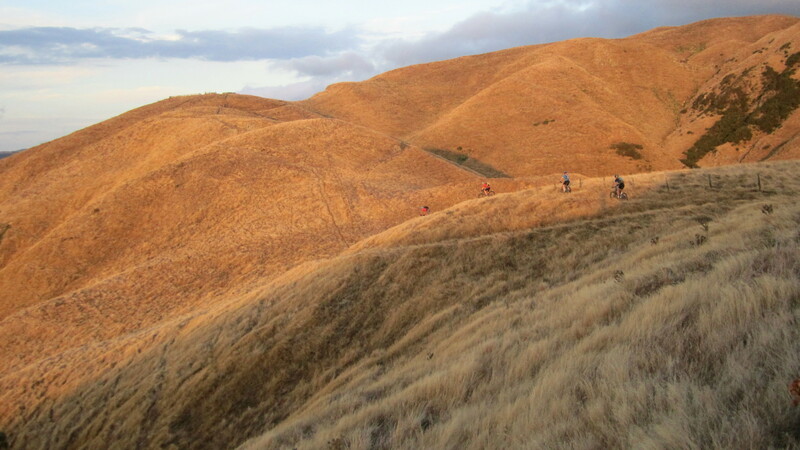 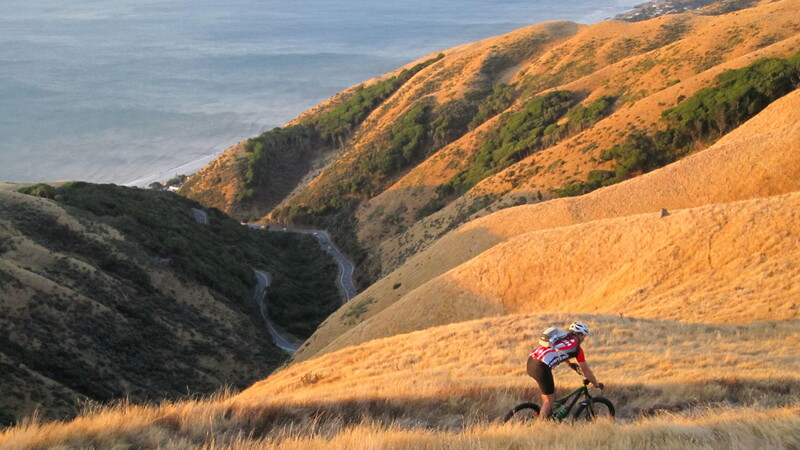 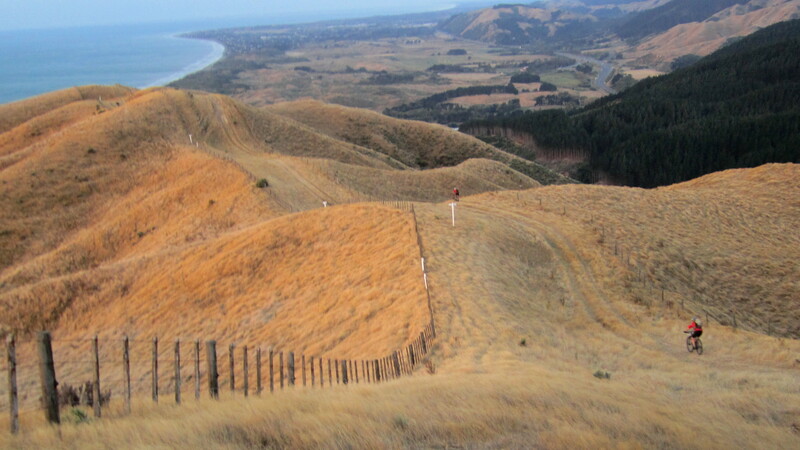 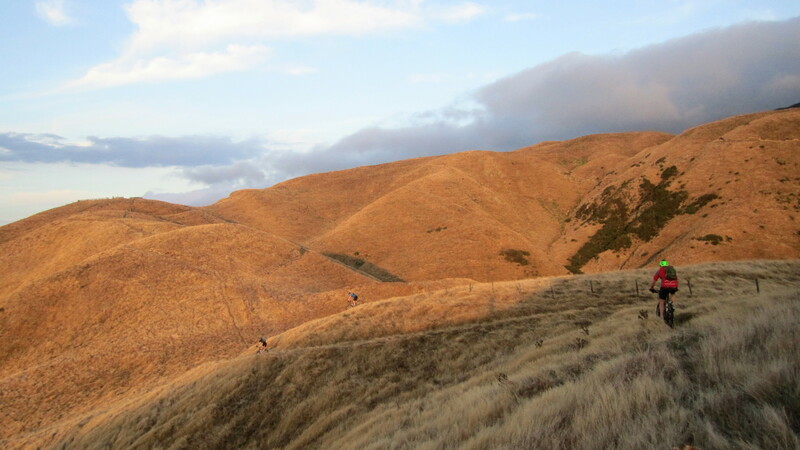 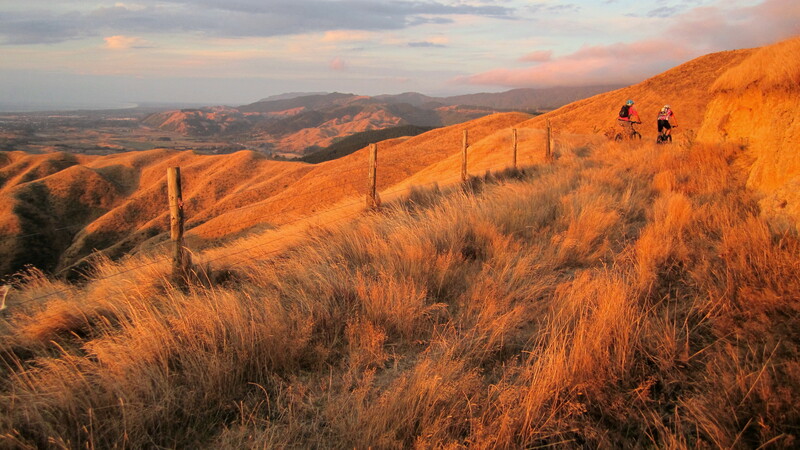 Late summer ride up in the hills above The Kapiti Coast, a different ride on a Wednesday evening, not a lot of track to follow now that the farm has closed, all that nicely cropped grass chewed down by the sheep has turned into wheel eating matting which makes for challenging hill climbs. 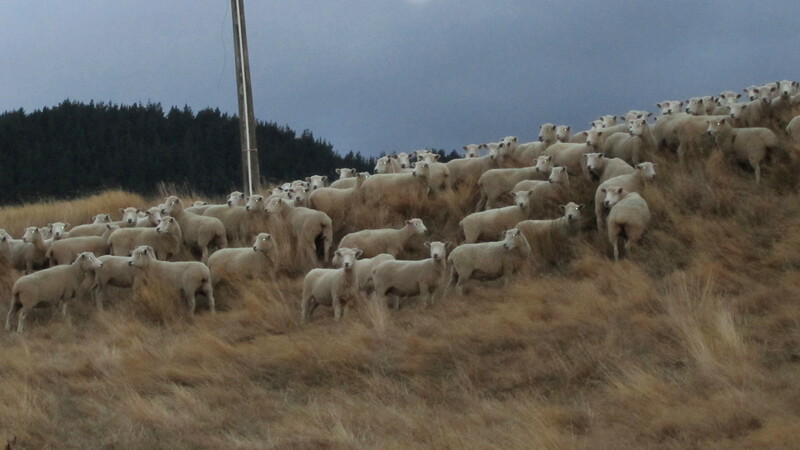 Not a lot of green after the long dry summer. 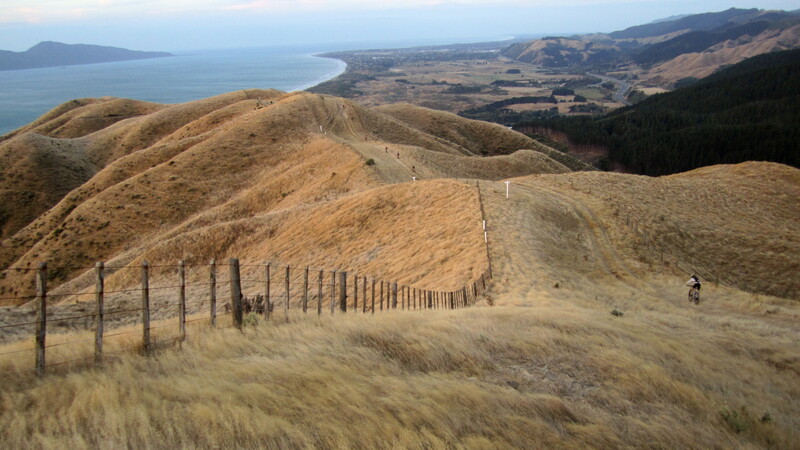 But the views from up in the hills are pretty good although the southerly wind was blowing strong. 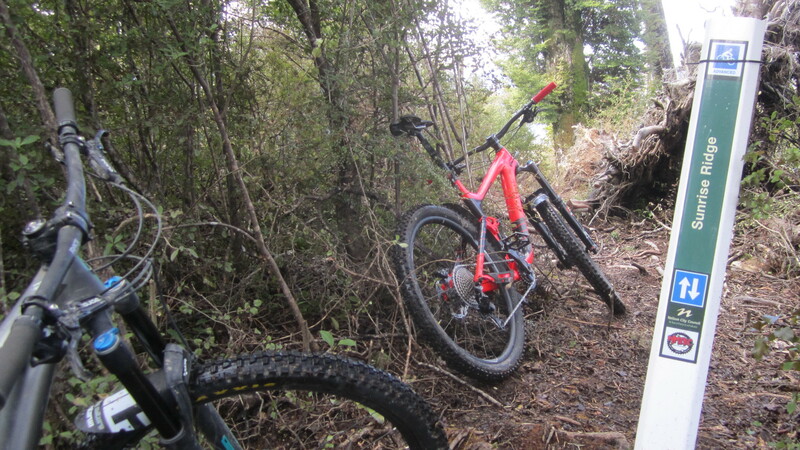 And once you have done the last climb past the stock yards the downhill is a real blast with plenty of opportunities for unexpected dismounts… but not on this trip. 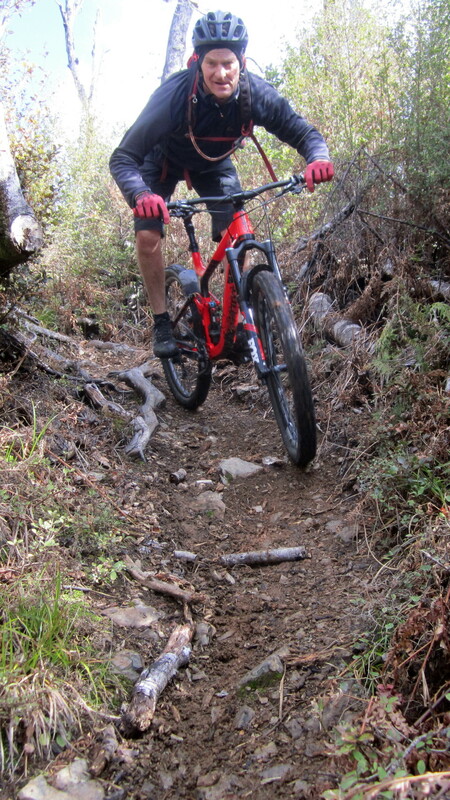 Steve. 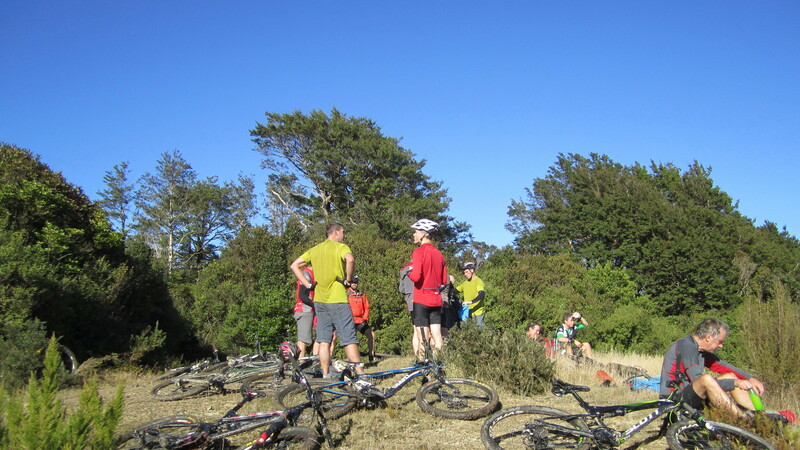 And a bunch of good keen HVMBC folk who don’t always stay on the ‘straight-n-narrow’. 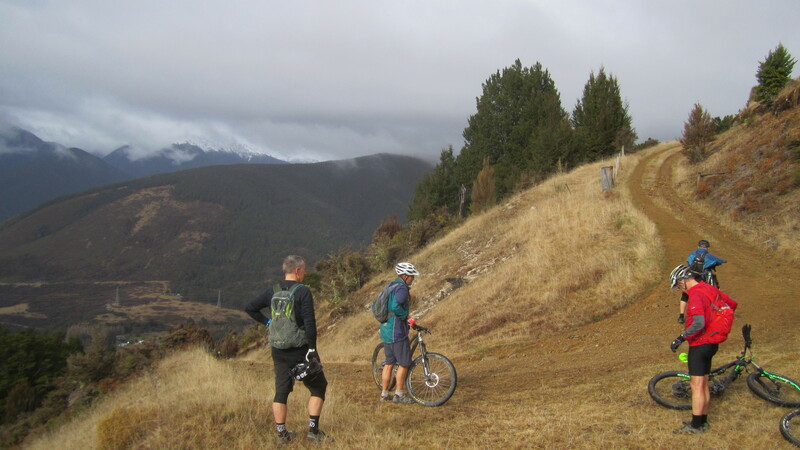 And so it was that on a cool August morning with a southerly blowing fine misty rain over the grey hills we set off with the 7°C breeze cooling our knees, this time tackling the ride in a clockwise direction so that we could ‘ride’ down from Burnt Spur to The Summit. 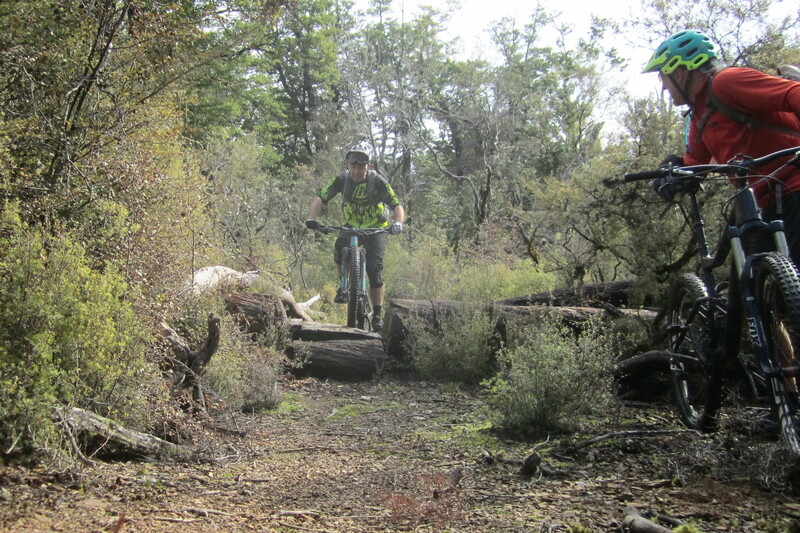 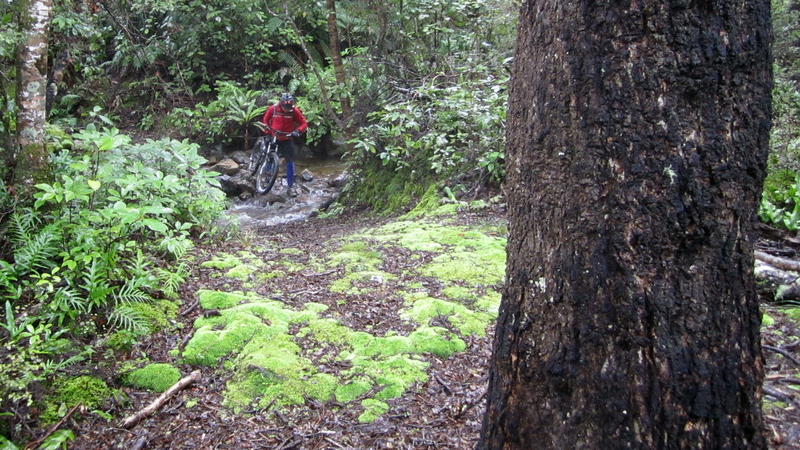 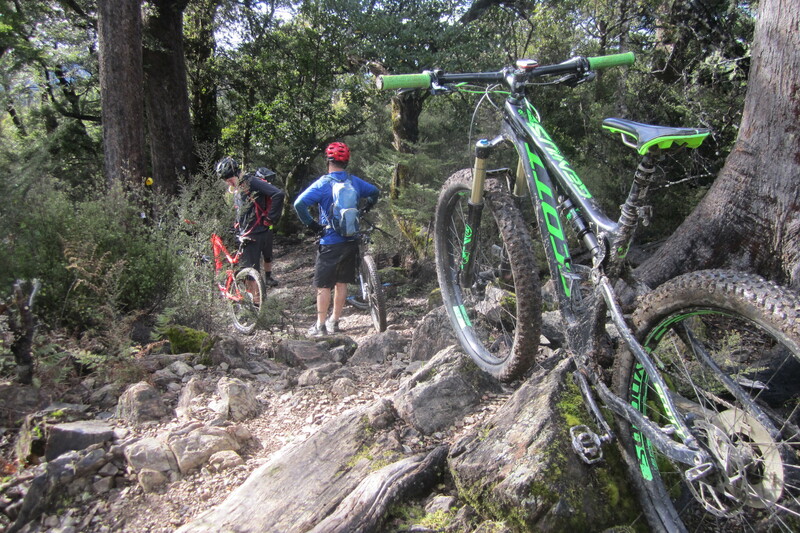 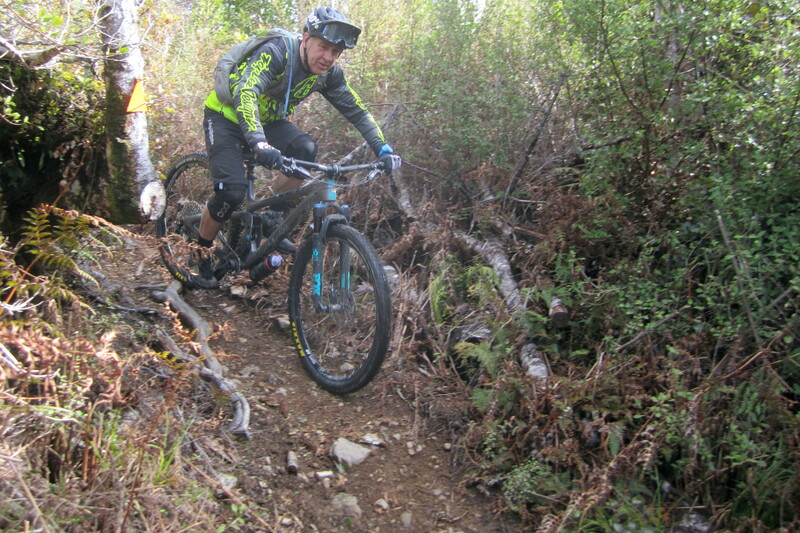 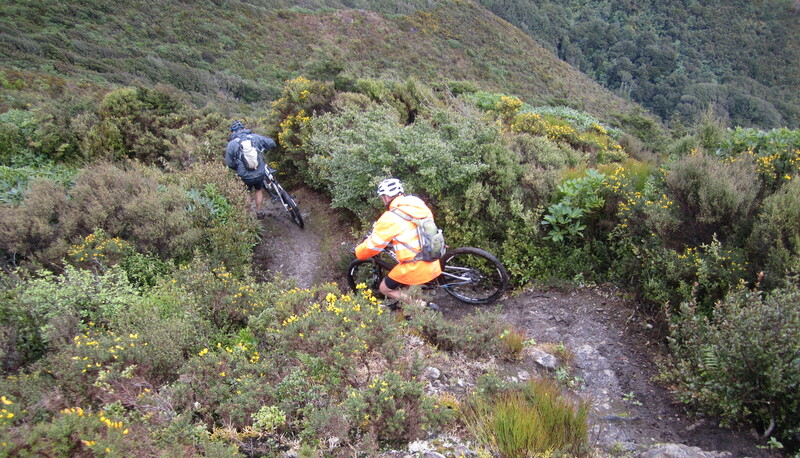 The ride up to the beginning of the Pylon Track from Kiwi Ranch is a good warm up through some challenging bush sections, especially in the wet. 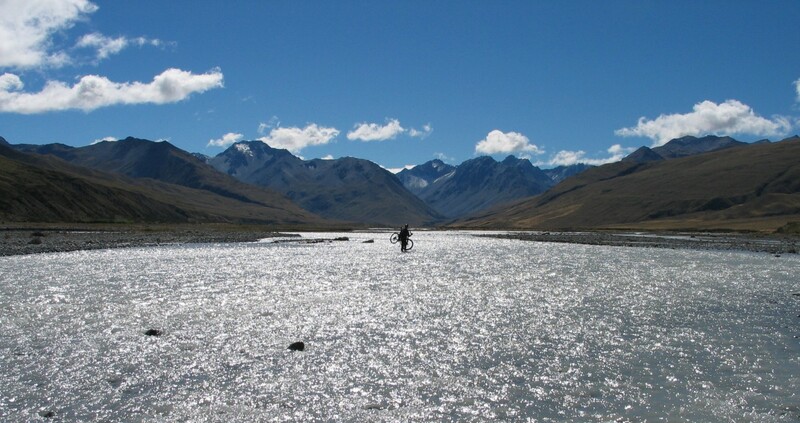 Distance: 28km. 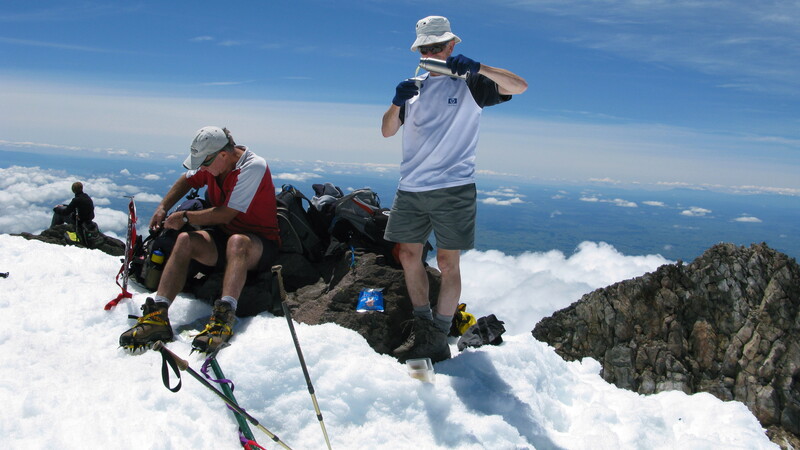 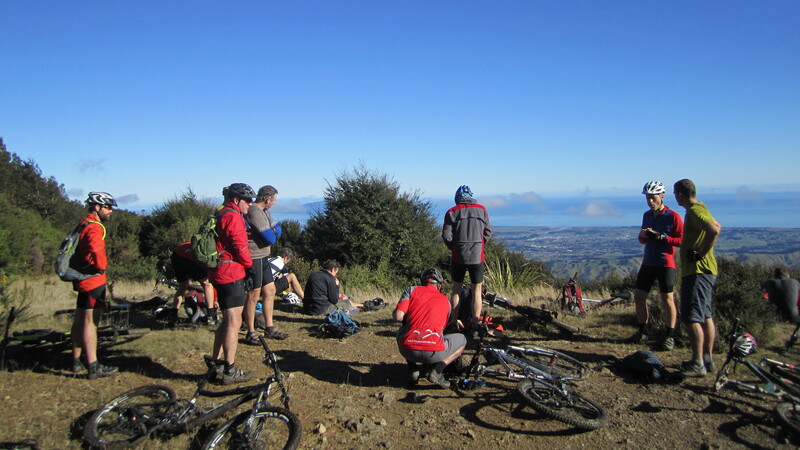 Altitude Climb: 1055m. 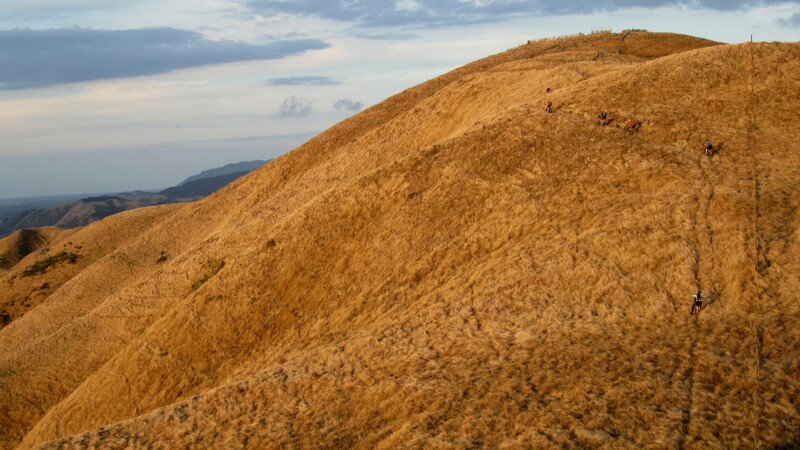 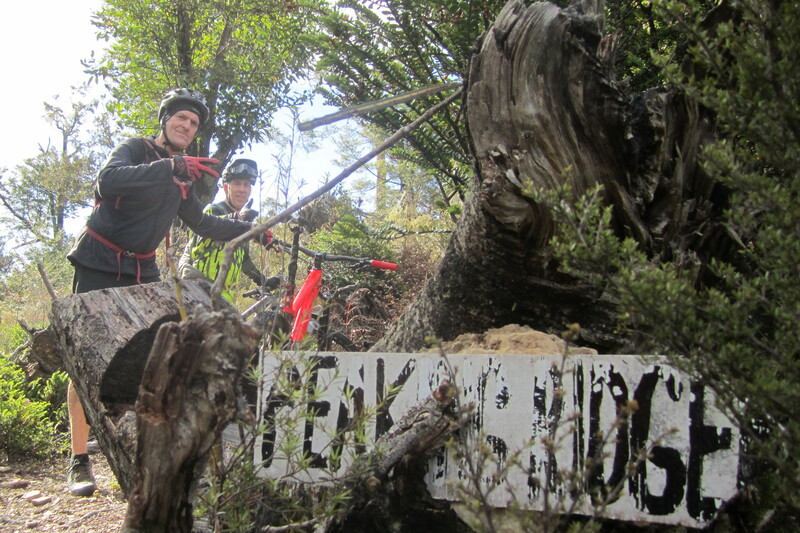 Altitude high point: 700m. 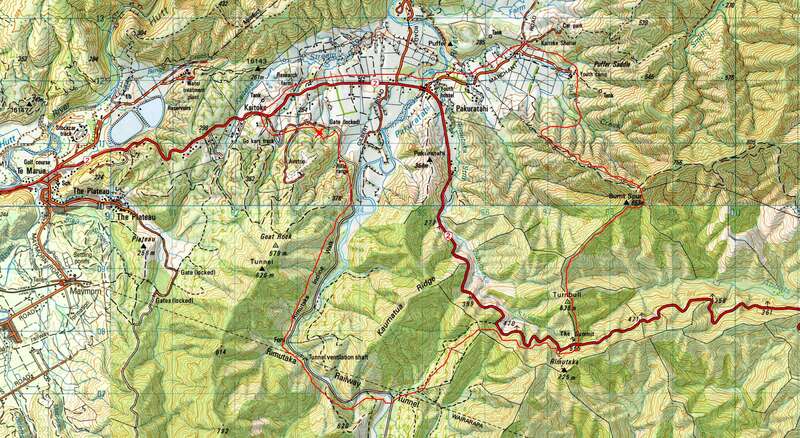 Total Time: 3H 30m. 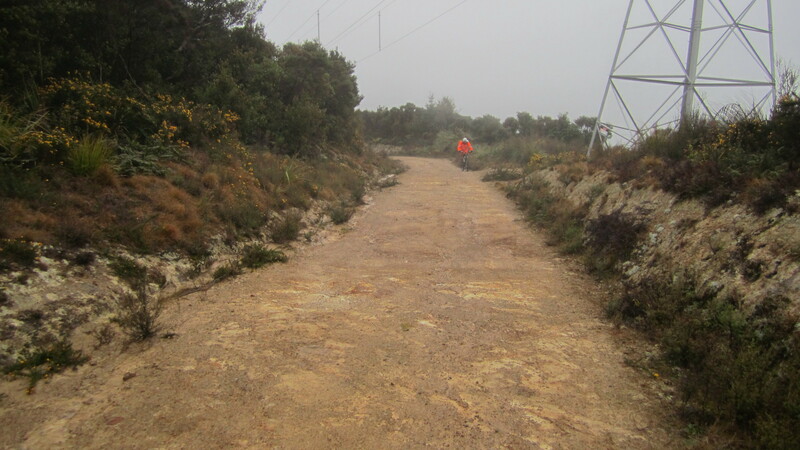 Ride Time 2H 55m. 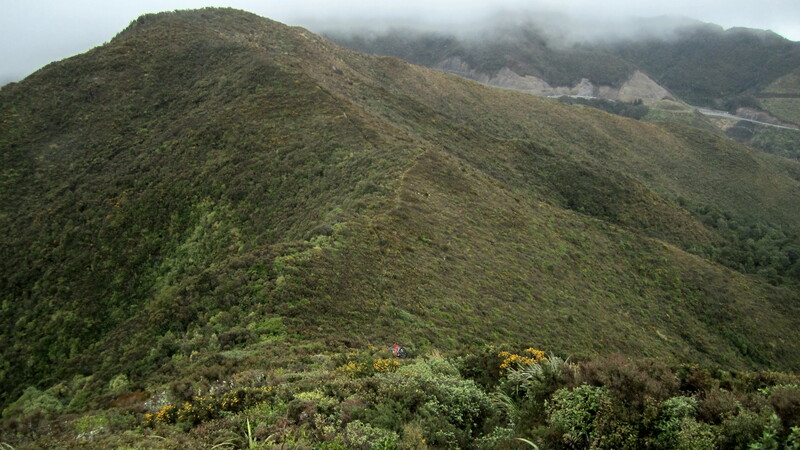 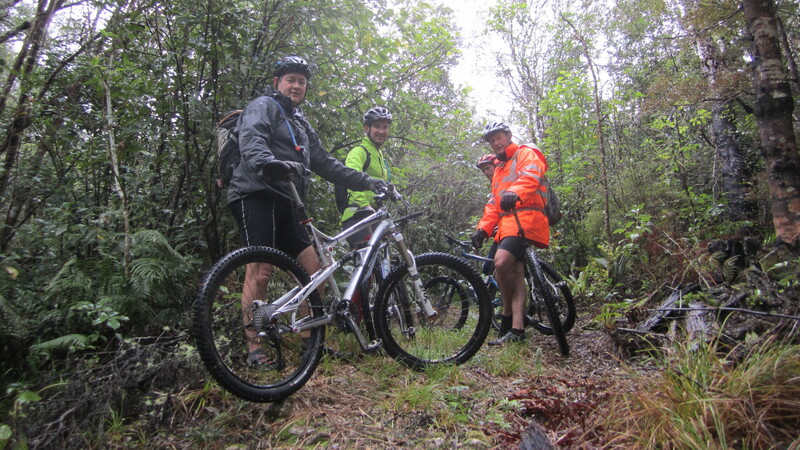 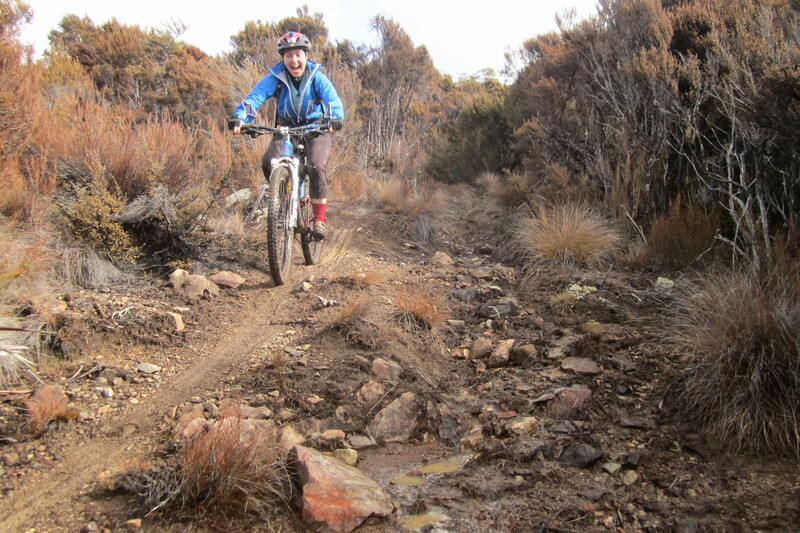 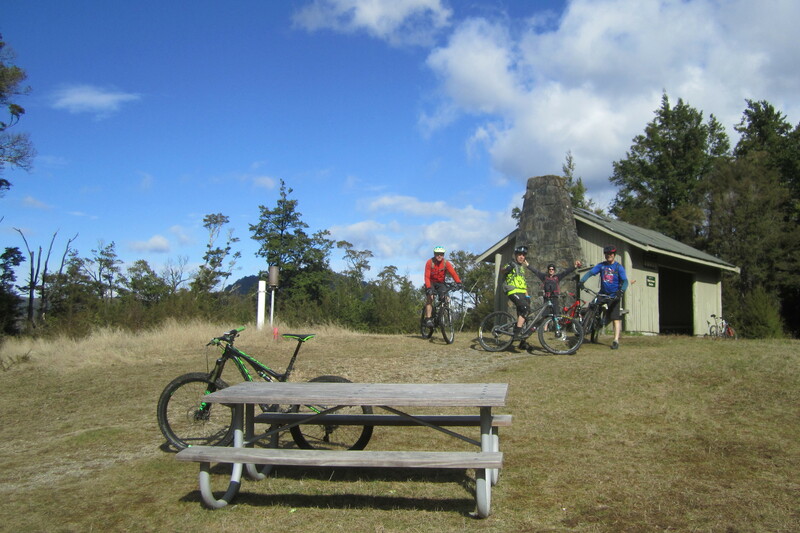 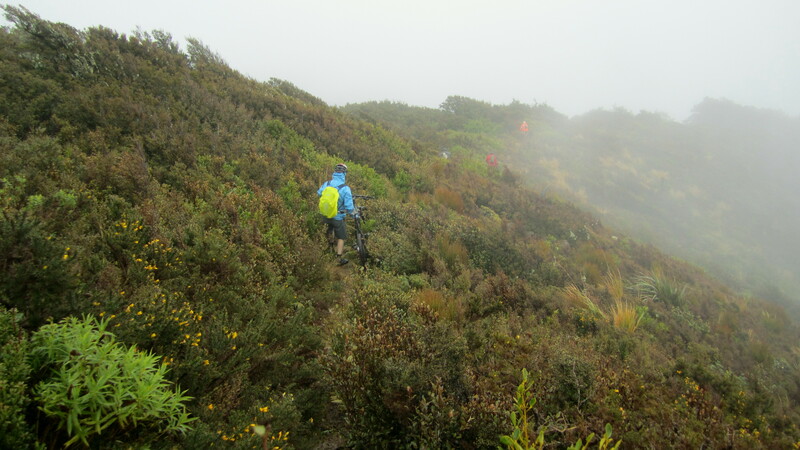 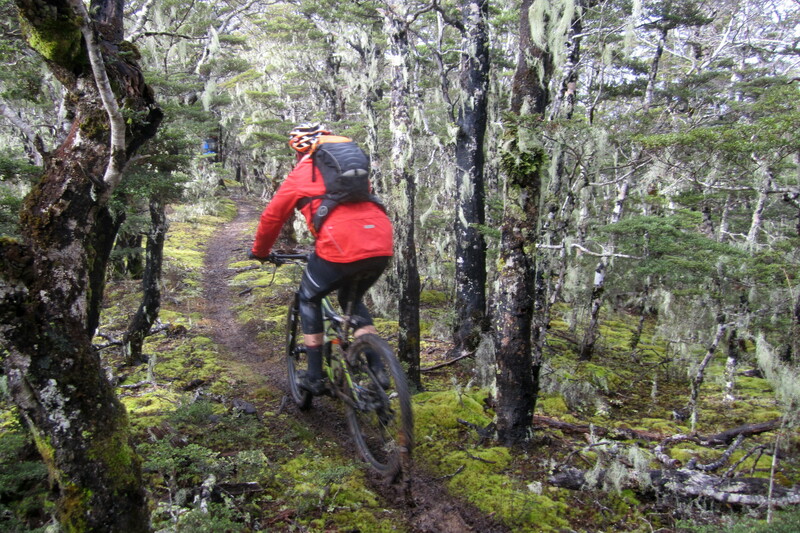 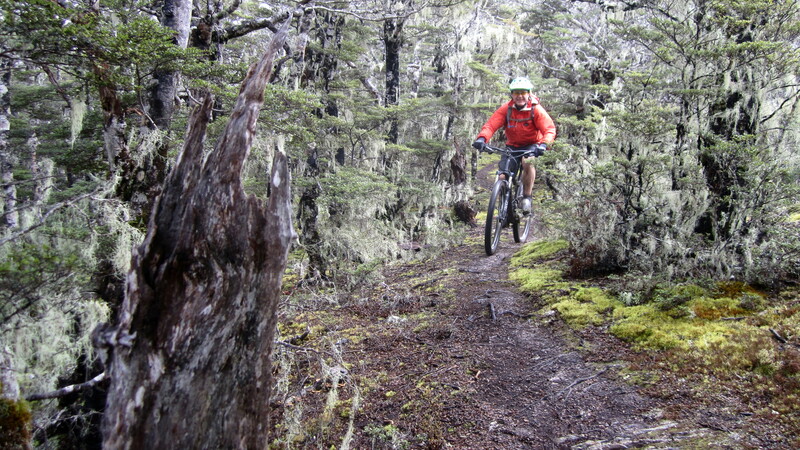 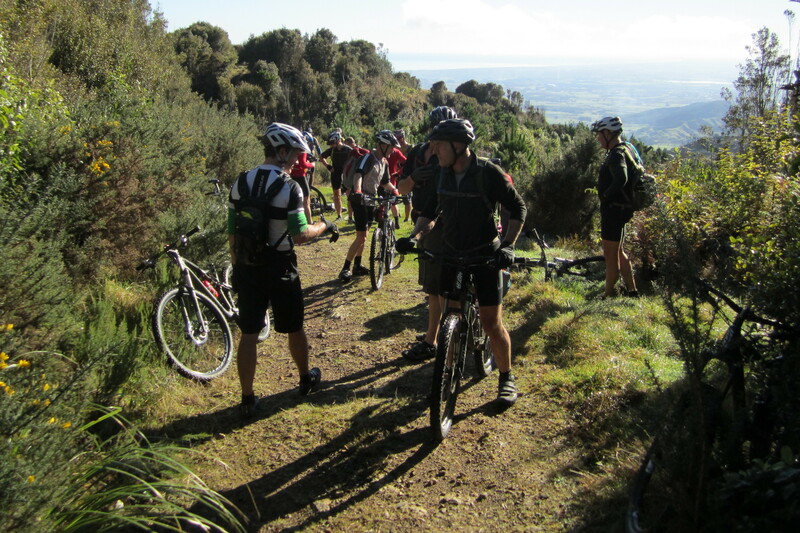 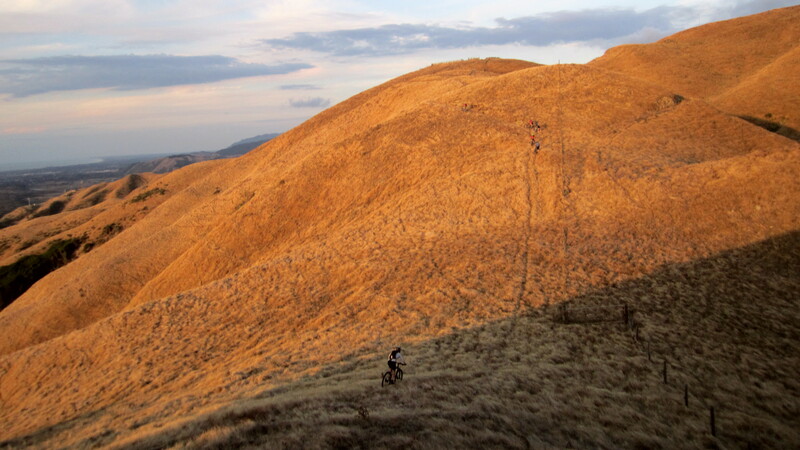 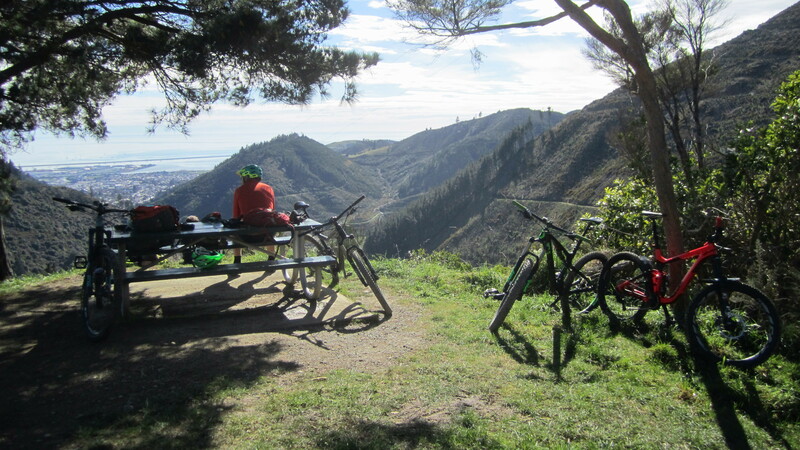 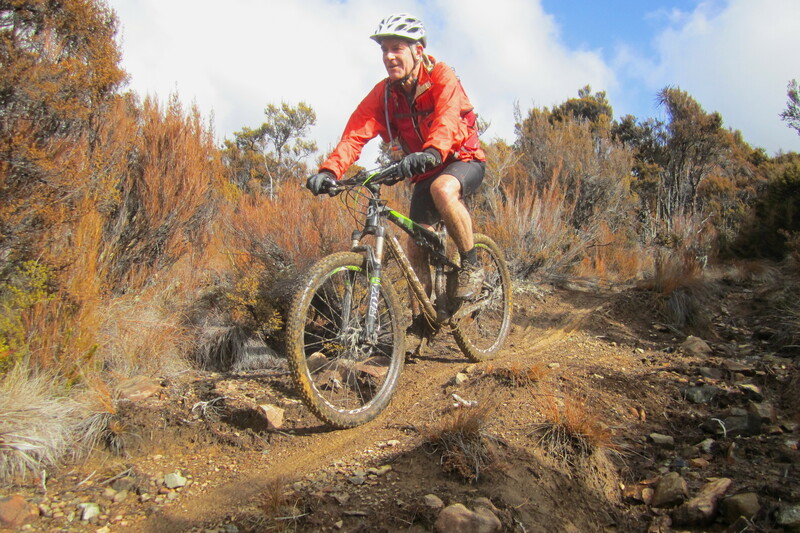 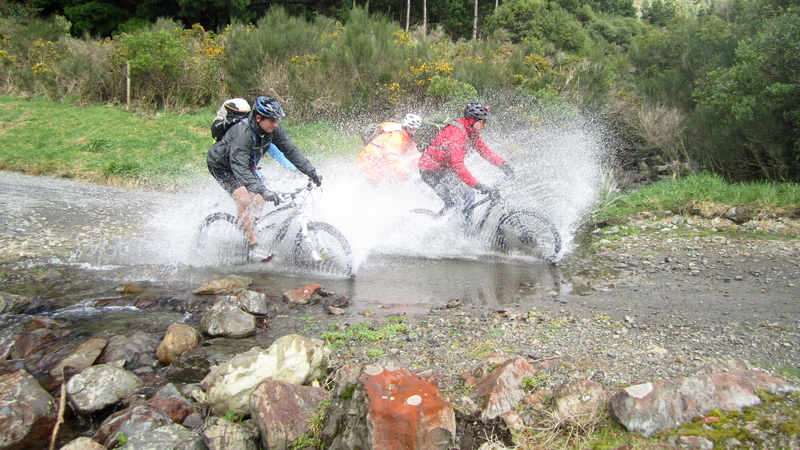 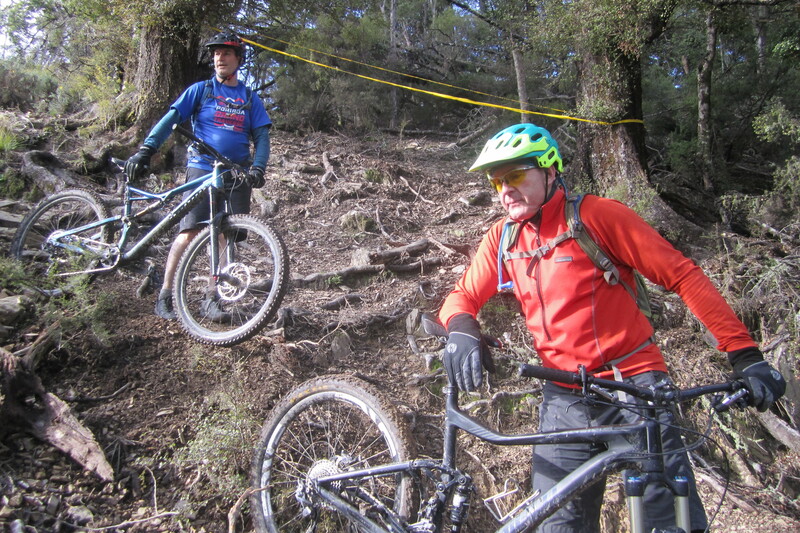 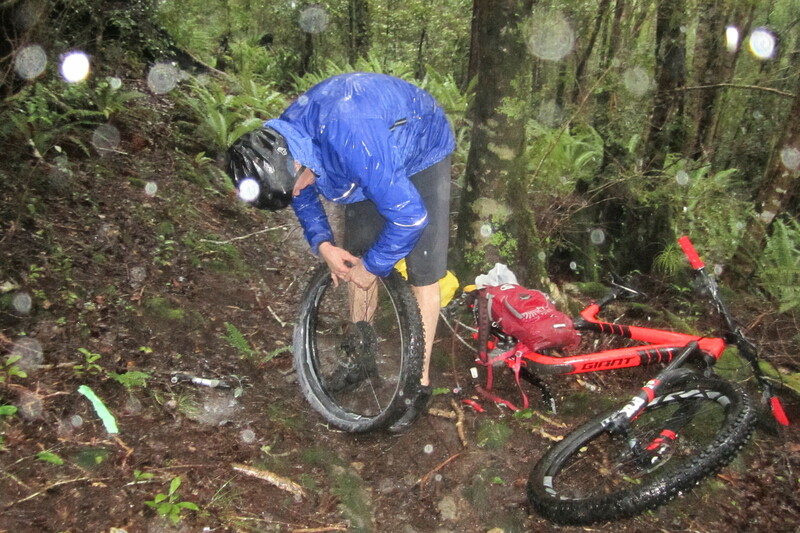 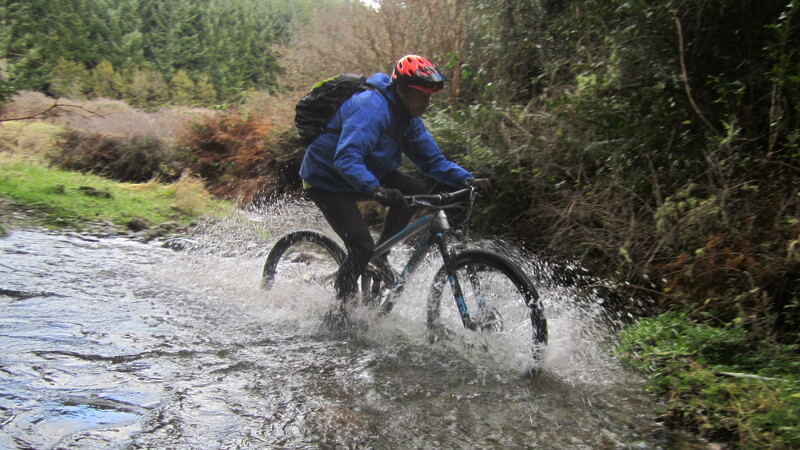 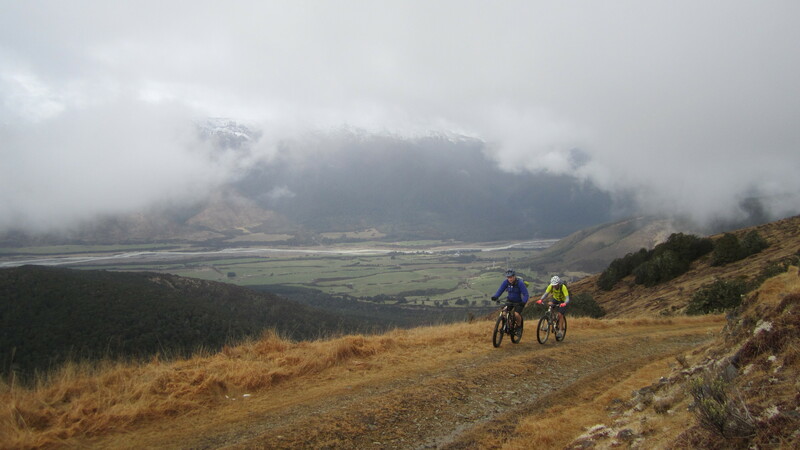 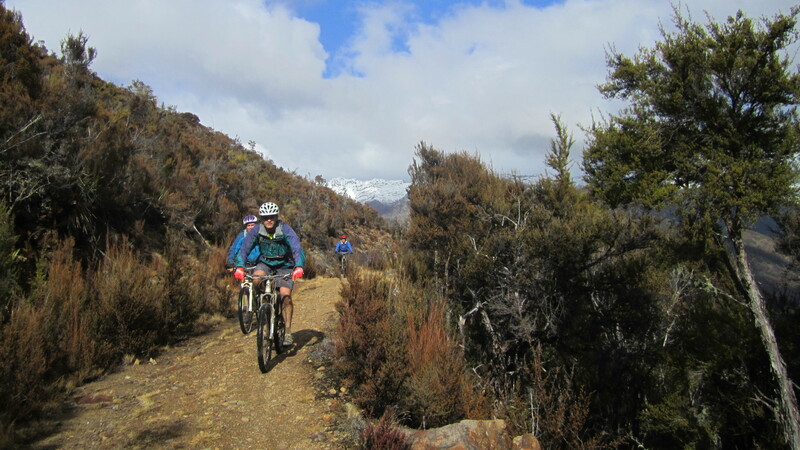 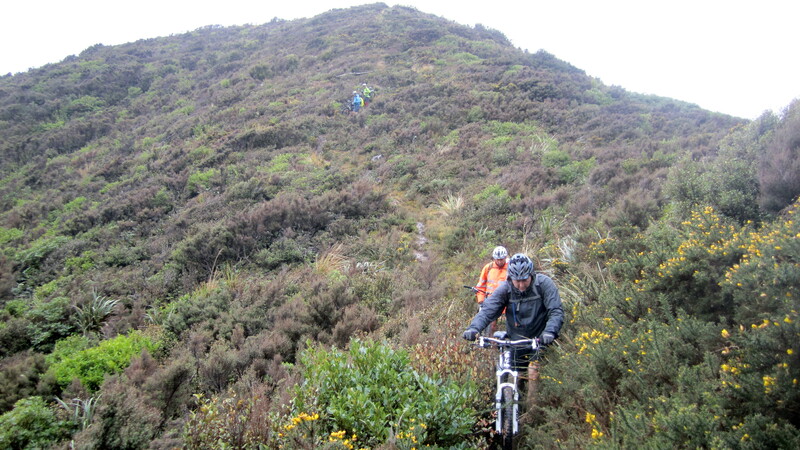 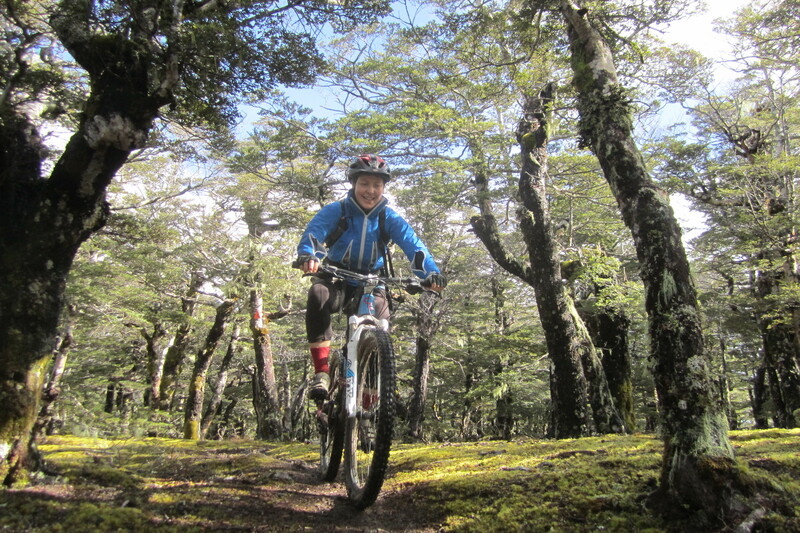 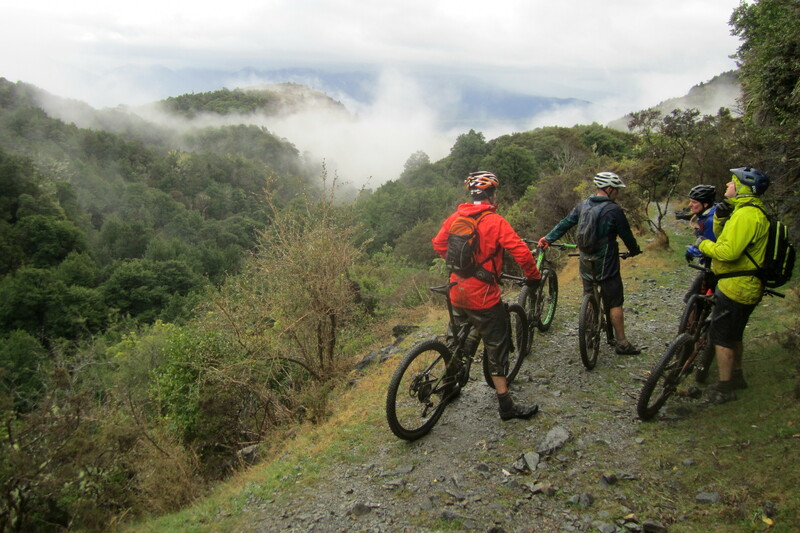 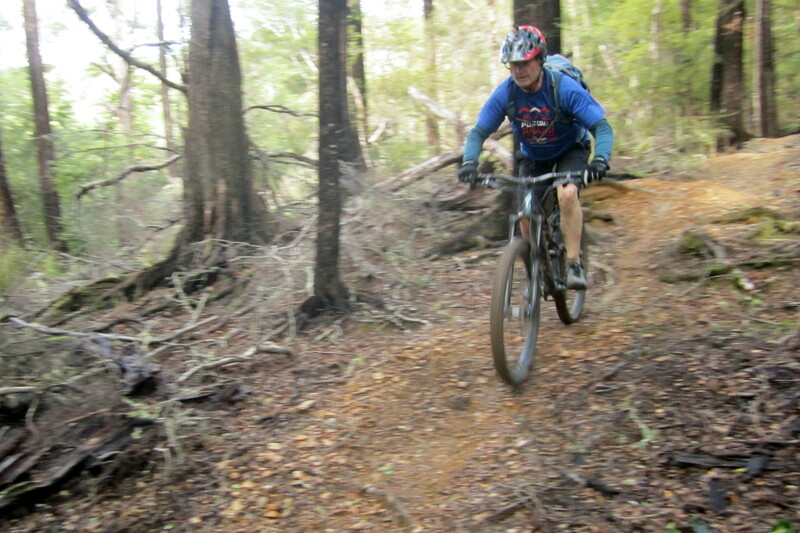 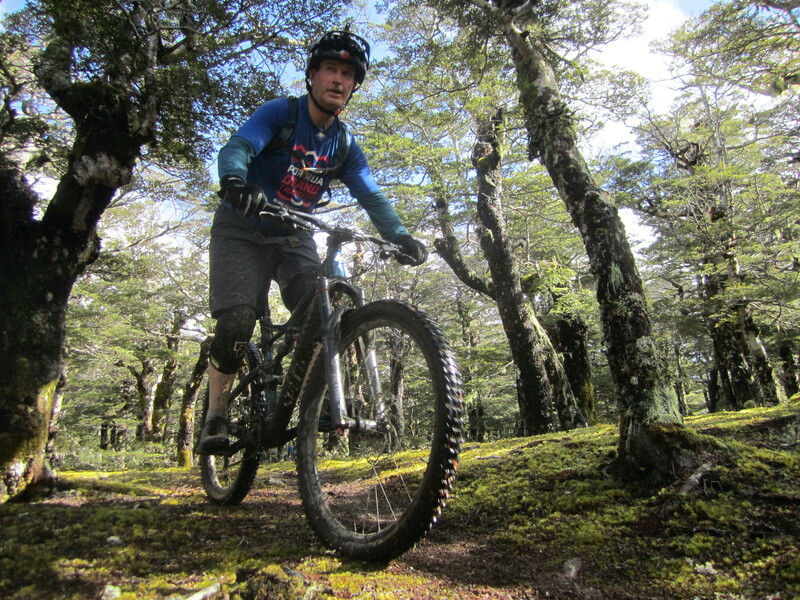 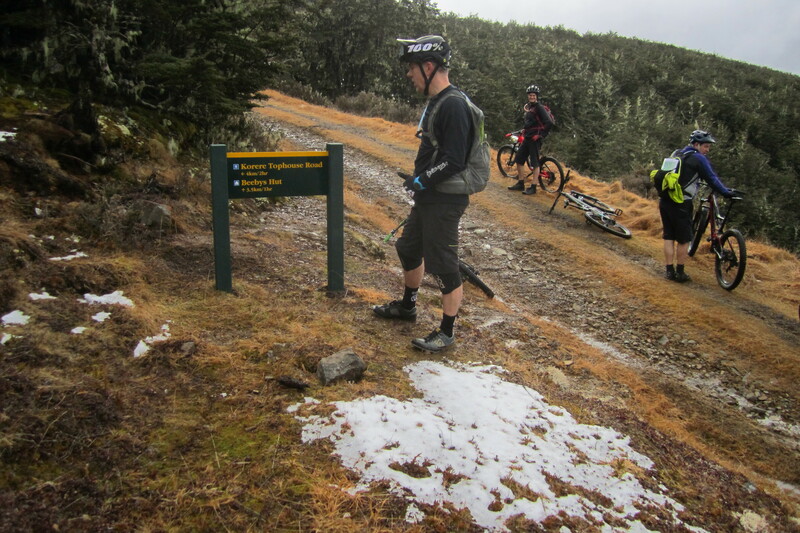 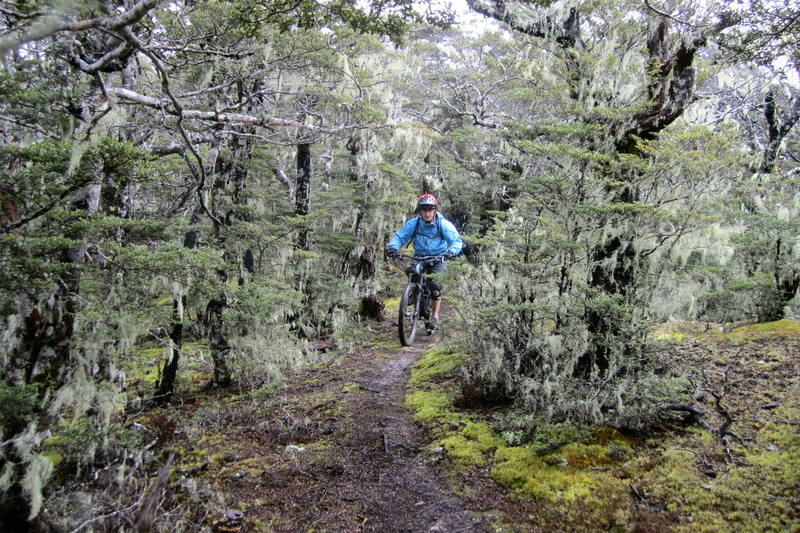 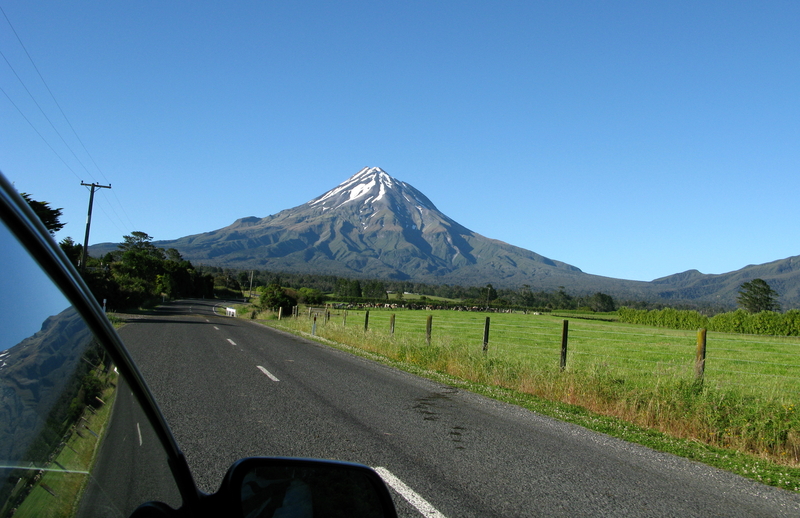 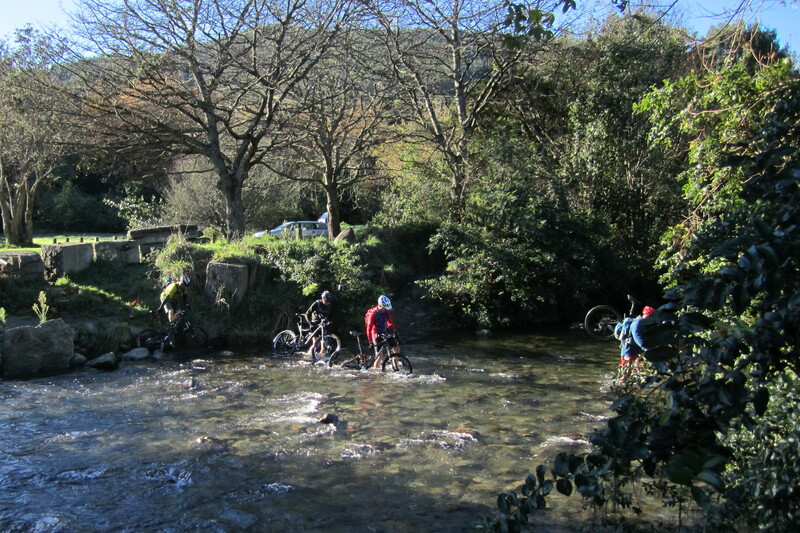 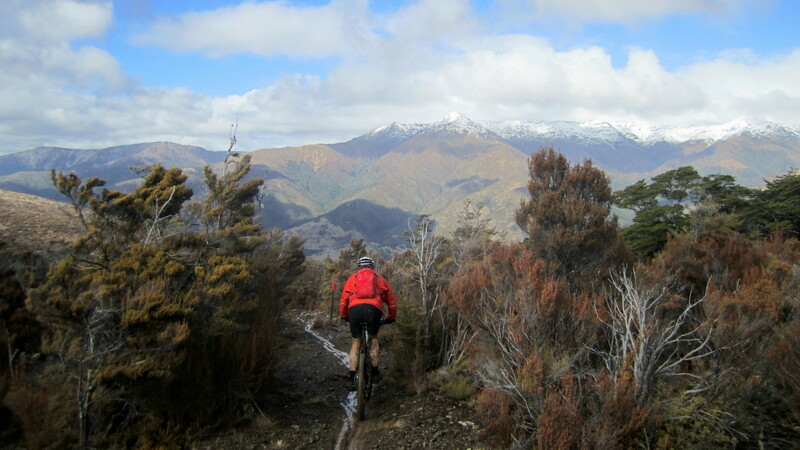 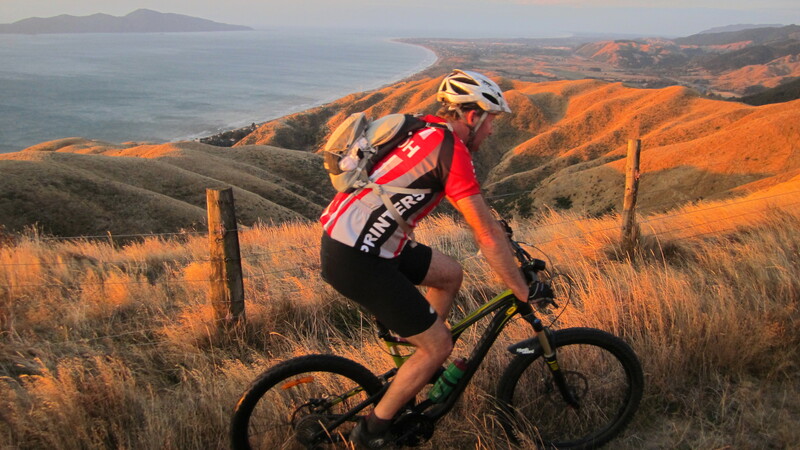 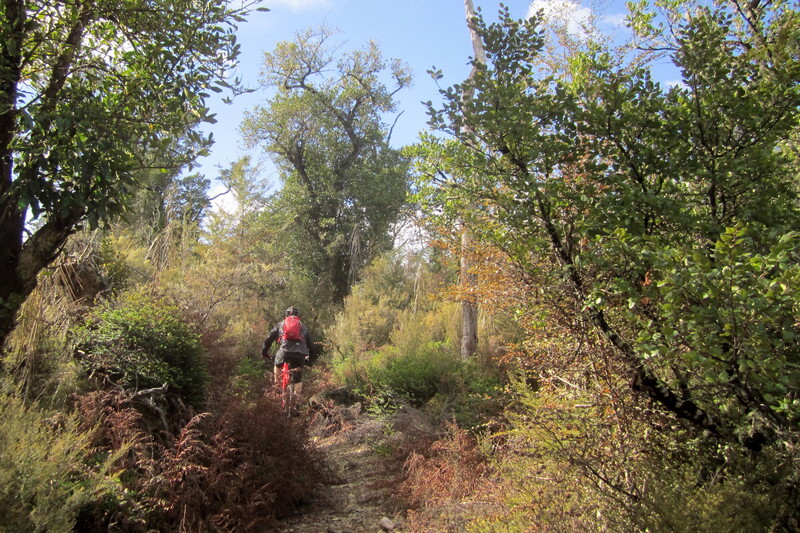 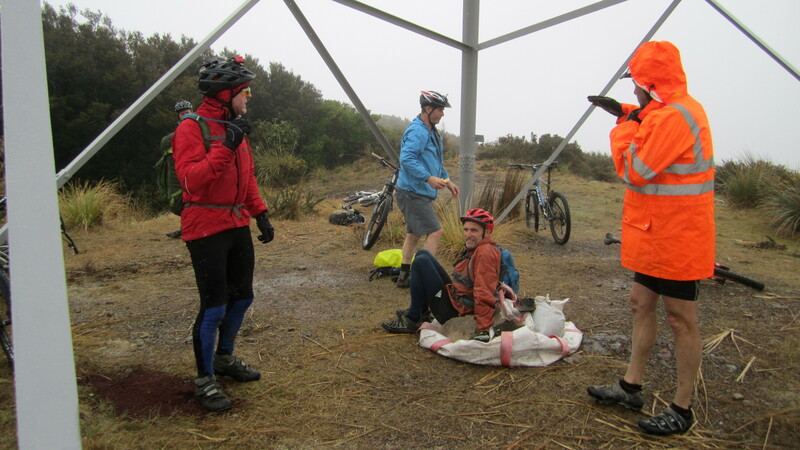 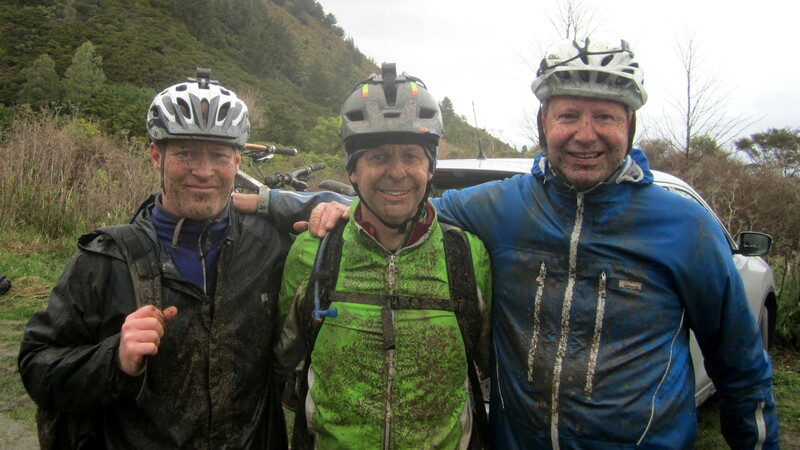 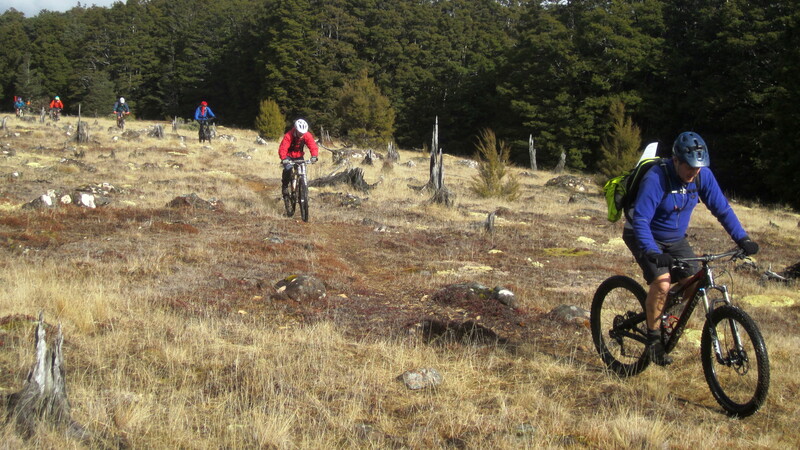 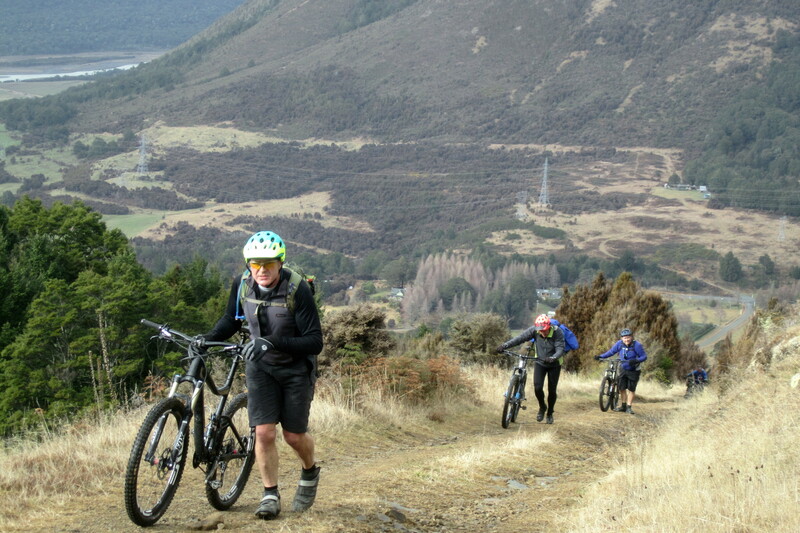 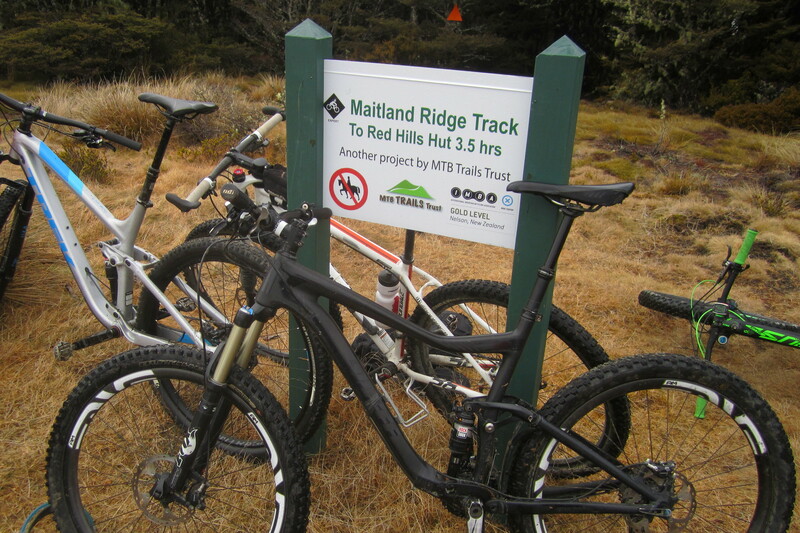 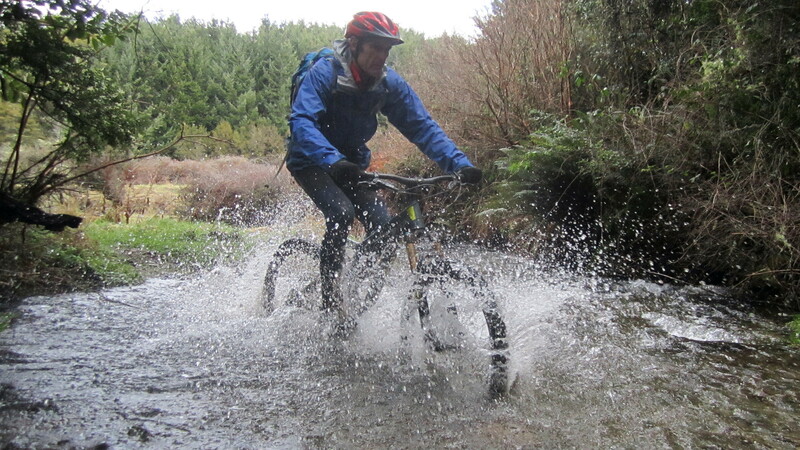 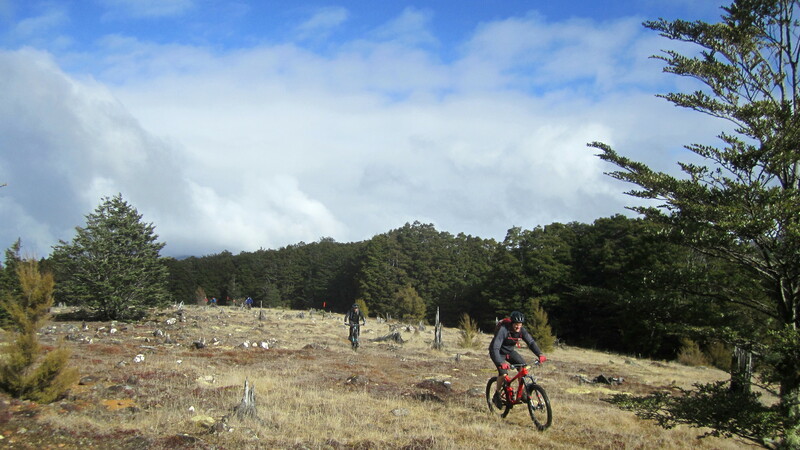 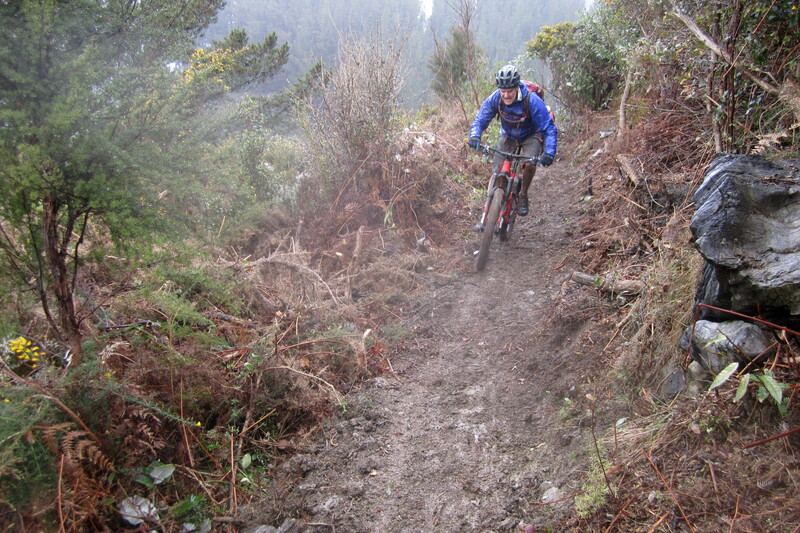 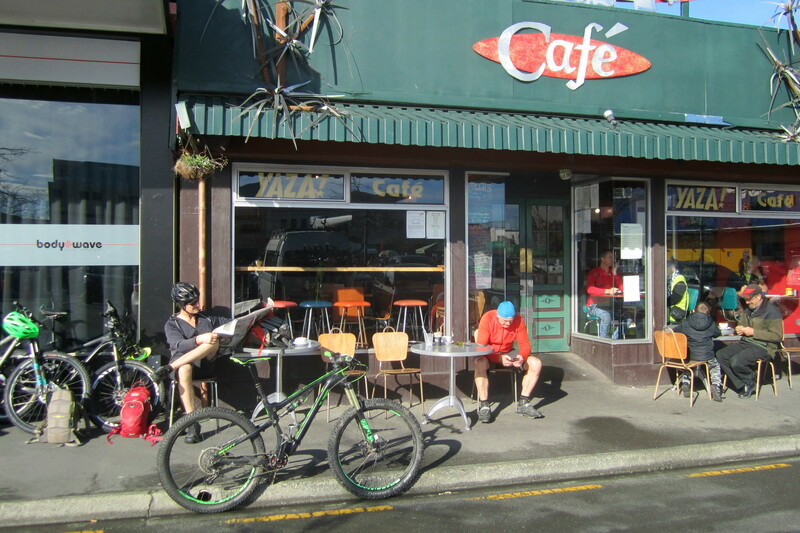 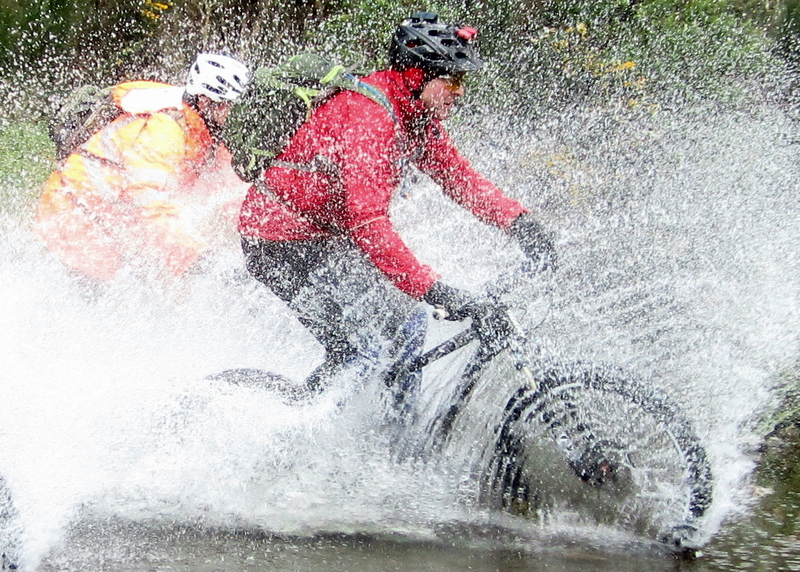 Mt Thompson can be, and usually is an interesting ride… Just 80km out of Wellington. 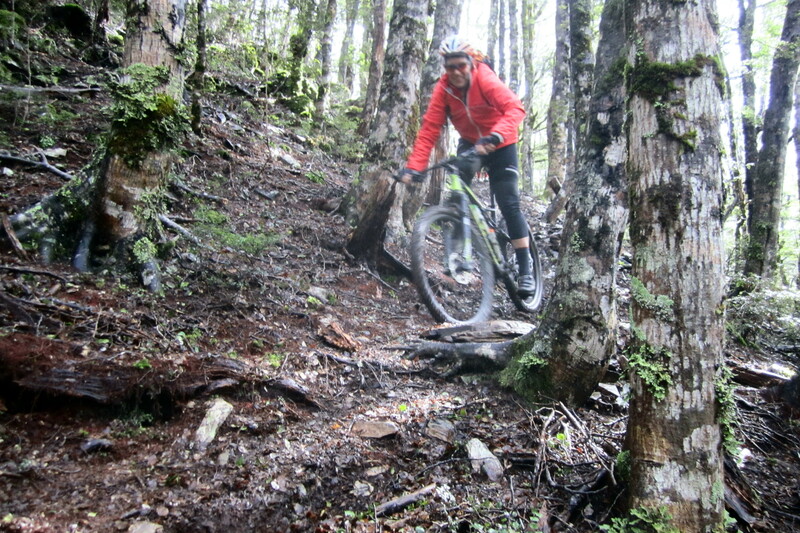 Mt Thompson is a little over 700m in altitude and you have to earn the downhill by climbing up there first, a nice cool river crossing before the long climb. 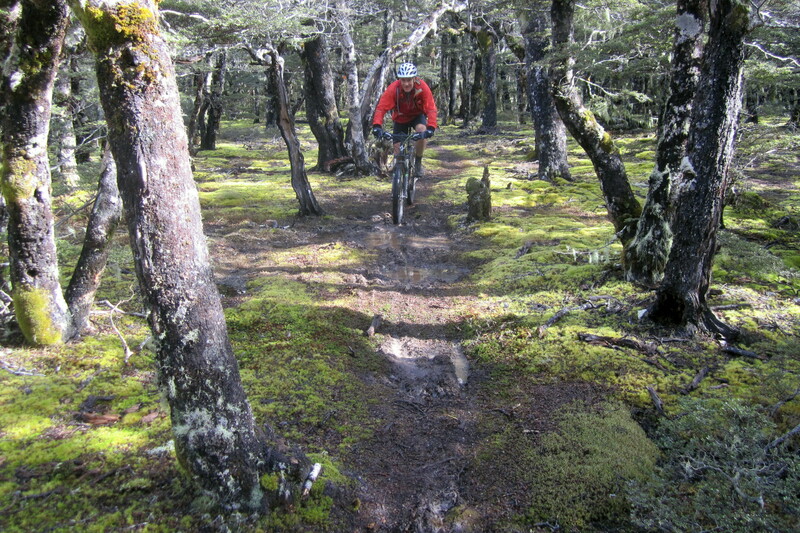 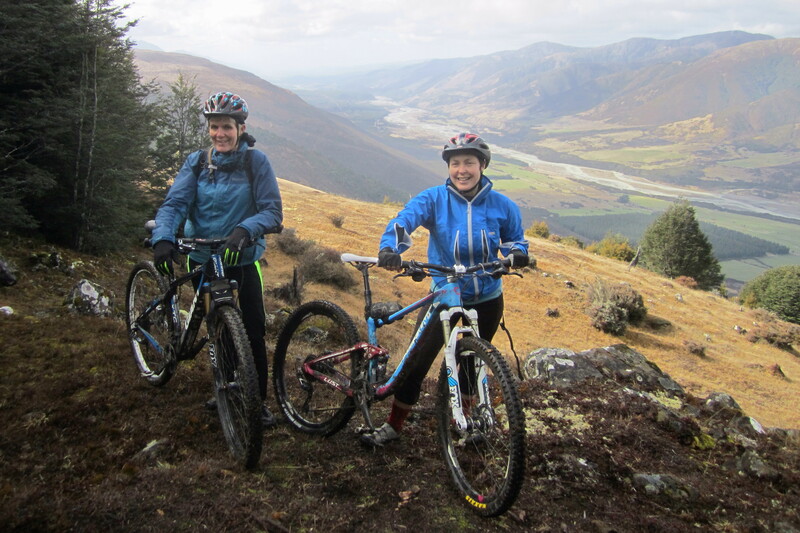 No fancy MTB tracks on this ride, just logging roads to get you most of the way up and then old four-wheel-drive tracks along a ridge through good sized bog-holes to get you to the top. 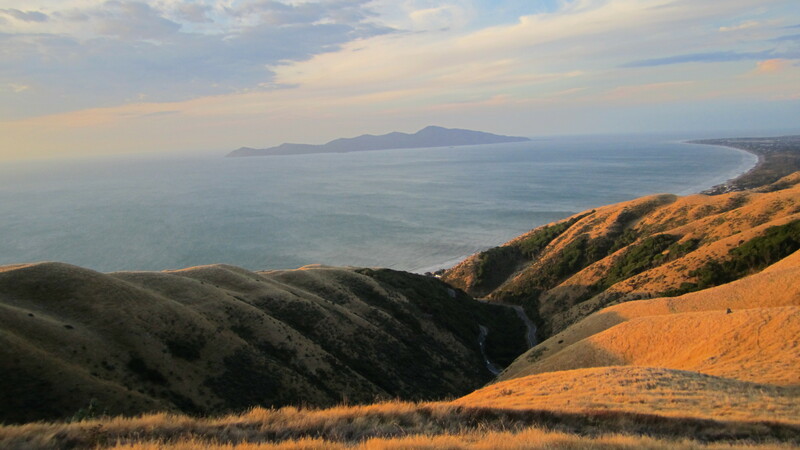 And on a good day there are views to the South Island, the Marlborough Sounds and all the way to Mt Taranaki 200km away. 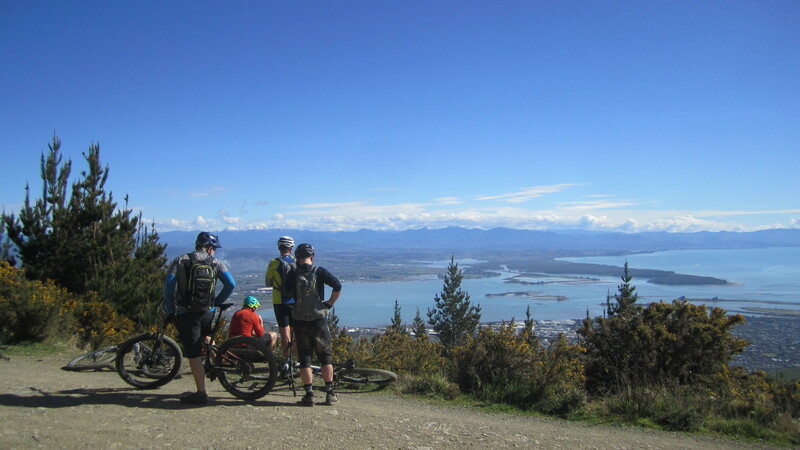 Anyway back on Mt Thompson after being able to sit in the sunshine at 704m and munch on a sandwich on the top of Mt ‘T’ it is then time to put on an extra layer, preferable waterproof ready for the wild downhill on something resembling a creek bed for 600m of descent over about 3km until you reach the ‘Taranaki’ gate at the bottom, enjoyed the downhill so much that no photos were taken until the stop at the bottom to check all body parts were still connected. 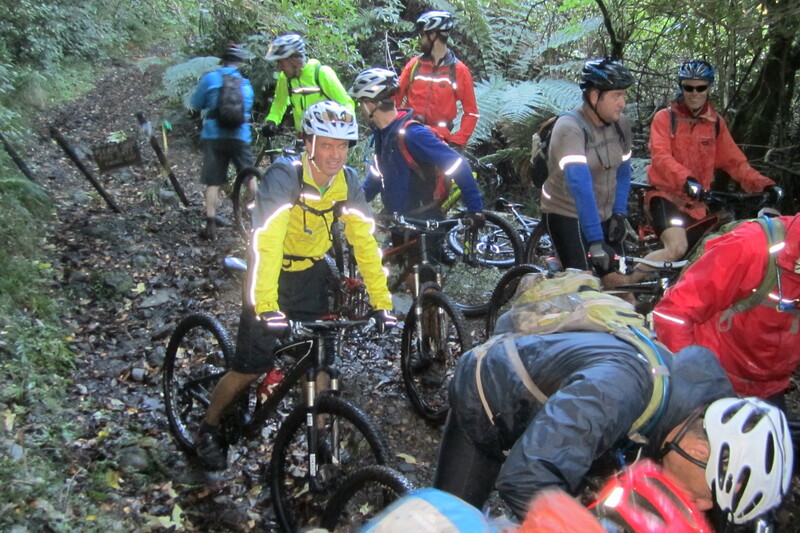 Steve, and 14 other good keen men, 6 who were first-timers.